The 34 metre motor yacht 2 J’s has been sold in a joint deal between Richard Tilley of Sunseeker London and Martyn Skelton of Sunseeker Andalucia. 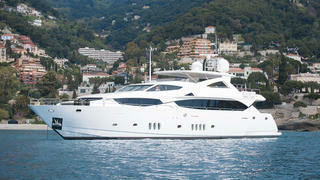 Built in GRP by UK yard Sunseeker International, 2 J’s was delivered in 2010. A sleek interior in gloss cherry wood throughout accommodates eight guests in four cabins consisting of a main deck master suite, a VIP suite and port and starboard twins, all with en suite bathroom facilities. In addition, there are quarters for five crew. The expansive main saloon has a large settee to port, occasional armchairs and a bar. Separating the lounge from the formal dining area with seating for 10 guests is an entertainment centre including a large television screen on a rise and fall mechanism. A feature is that the air conditioning has been upgraded to a tropical specification. The aft cockpit is geared towards al fresco entertaining with a built in upholstered settee, rectangular table and five barrel chairs in teak. Up on the flybridge is a helm station, built in U-shaped seating to starboard, a spa tub, wet bar and a sunbathing area, all sheltered by a custom GRP hard top with a retractable canopy. More sunbathing is available on the foredeck, fitted with a huge sun pad. Twin 2,434hp MTU diesel engines power her to speeds up to 26 knots. 2 J’s was asking £4,750,000 with VAT paid.